- creates more usable room in your home. NOTE: The tasks and timings shown here for your Charity Donations are based on a single-family home (owned), located in Massachusetts, United States, with priority set at ‘1 star' or higher, for all possible goals. If you set your personalization differently in your Home Wizard app, then you may get reminders for different tasks and timings in your recommended home care program for your Charity Donations. Donations can include household goods, clothing, lawn care equipment, electrical appliances, white goods (e.g., washers, dryers, refrigerators), etc. The items should be in good condition, or be able to be repaired. Most agencies will not receive items that are beyond repair. Remember to get a receipt for your donation. 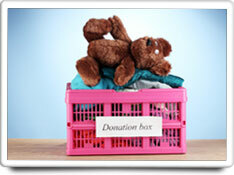 The benefits of this task are moderately high, depending on how many items you have to donate. The cost of this task is moderate, depending on how many items you have to donate, and how easy or difficult it is for you to gather these items together.